Why do people with Alzheimer’s stop recognizing their loved ones? Alzheimer’s not only steals people’s memories but also their ability to recognize faces, which widens the gulf between people with this disease and their loved ones. A recent study has demonstrated that, beyond causing memory problems, Alzheimer’s disease also impairs visual face perception. This finding may help families better understand their loved one's inevitable difficulties and lead to new avenues to postpone this painful aspect of the disease. Research in this area by the team of Dr. Sven Joubert, PhD, a researcher at the Centre de recherche de l'Institut universitaire de gériatrie de Montréal of the CIUSSS du Centre-Sud-de-l’Île-de-Montréal and a professor with the Department of Psychology at Université de Montréal, has just been published in the Journal of Alzheimer’s Disease. Face perception plays a fundamental role in human communication, which is why humans have evolved into experts at quickly detecting and identifying faces. This faculty is thought to depend on the ability to perceive a face as a whole. Also known as “holistic perception,” this ability is in contrast to the local and detailed analysis required to perceive individual facial features, such as the eyes, nose or mouth. Dr. Joubert’s study has demonstrated that the holistic ability to perceive faces is impaired by Alzheimer’s disease. 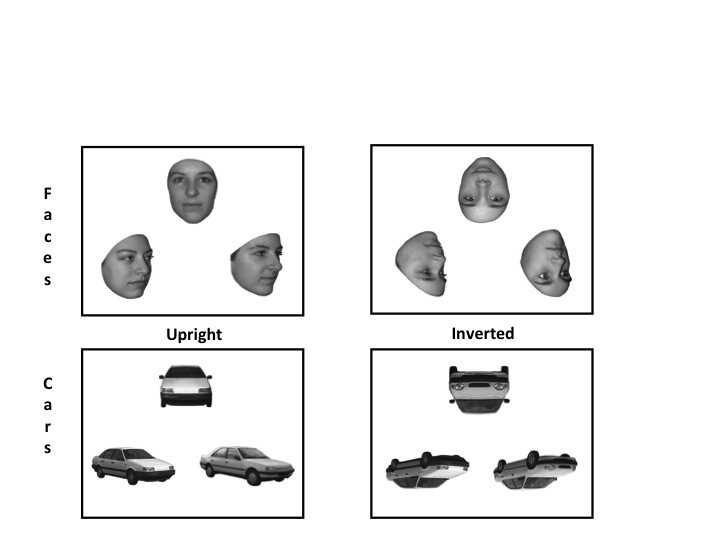 For the study, the Montreal team recruited people with Alzheimer’s along with healthy seniors to study their ability to perceive faces and cars in photos that were either upright or upside down (see the figure for examples of different displays/trials of stimuli). Dr. Joubert explains the team’s findings: “The results for people with Alzheimer’s were similar to those in the control group in terms of answer accuracy and the time to process the upside-down faces and cars. To perform these tasks, the brain must perform a local analysis of the various image components perceived by the eye. However, with the upright faces, people with Alzheimer’s were much slower and made more mistakes than the healthy individuals. This leads us to believe that holistic face recognition in particular becomes impaired. Subjects with Alzheimer’s disease also demonstrated normal recognition of the upright cars, a task that in theory does not require holistic processing. This suggests that Alzheimer’s leads to visual perception problems specifically with faces.” What’s also surprising about this impairment is that it is observed in the early stages of the disease. Overall, Dr. Joubert’s study better explains the mechanism involved in the problem that people with Alzheimer’s have with recognizing the faces of family members or celebrities. The fact that impaired facial recognition might stem from a holistic perception problem—and not just a general memory problem—opens the door to different strategies (such as the recognition of particular facial traits or voice recognition) to help patients recognize their loved ones for longer. Sven Joubert is supported by a Chercheur-boursier senior award from the Fonds de recherche du Québec – Santé (FRQ-S). Sven Joubert and Isabelle Rouleau are supported by the Alzheimer Society of Canada. Delphine Gandini was supported by a CIHR postdoctoral award and Guillaume Vallet is supported by a FRQ-S postdoctoral award. Bruno Rossion is supported by the Belgian National Fund for Scientific research and a BELSPO grant.